The Jewish Journal reported earlier this week that Iraq’s first lady, Hero Ibrahim Ahmed, wife of President Jalal Talabani, paid a visit to the Simon Wiesenthal Center. The First Lady reminisced about her relationships with Jews of her Kurdish hometown, and, according to the Journal, toured the SWC’s Museum of Tolerance. Hero Ibrahim Ahmed, the petite first lady of Iraq, briefly recalled the killings and tortures the regime of dictator Saddam Hussein had inflicted on her fellow Kurds. 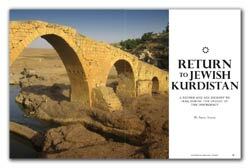 Of course, we at Moment thought of Ariel Sabar, whose piece in the current issue of our Magazine, “Return to Jewish Kurdistan,” describes his trip to the Kurdish village where his father had grown up. I was aware of the risks. But with my father’s advancing age, I thought that if we didn’t go that summer, we never would. I knew that my father saw Zakho as a kind of paradise of religious pluralism, where for hundreds of years Muslims, Jews and Christians had lived together in peace. “What do we have to fear?” I asked, playing to his nostalgia. But in the end, it was something else that moved him. Read the rest of Sabar’s article here.